From Superflux Beer Company brewing out of Strathcona Beer Company in Vancouver comes their “Double Infinity (Galaxy)” a Double IPA. The beer pours a cloudy orange colour with a white head. The aroma consists of tropical fruits, stone fruit and citrus with a herbal and floral finish. The flavour is of herbal hops with citrus rind, tropical fruits, melons, stone fruit, resin and bitterness with a hint of alcohol. The alcohol content comes in at 8%. Superflux Beer Company is a big player in the local North East IPA style and this one is killing it just like their other brews. Pick this up if you can find it. Commercial Description: We’re thankful for Galaxy Hops. They make better beer than turkey bones do. Hope you fellow Canadians enjoy your Thanksgiving holiday today! Our first Double IPA “Double Infinity” will be available in cans at Strathcona Beer Company while supplies last. From Six Corners Brew Works in Okotoks Alberta comes their “Triple Summit IPA” a Triple IPA. The beer pours a cloudy golden colour with an off white head. The aroma consists of floral hops, fruit with a mild sweetness. The flavour is of sweet tropical fruits, melon, citrus, resin, pine, bitterness and alcohol. The alcohol content comes in at 10.3%. This is a great style although undeserved and this is a great example of it. Commercial Description: Not for the faint of heart, this powerful, bright burst of hoppy goodness is like an uppercut to the taste buds. From Burlington, Ontario’s Nickel Brook brewed by Better Bitters Brewing Co. comes their “Equilibrium ESB”. The beer pours a cloudy brownish colour with an off white head. The aroma consists of bready malts, earth and some fruit sweetness. The flavour is of bready malts earth, bitterness and some melon like fruit. The alcohol content comes in at 5.5% with an IBU of 43. I wouldn’t call this a fully traditional ESB but it is pretty decent beer. Commercial Description: Balance is finding the point between two opposing forces for a more desirable outcome: Equilibrium. We crafted our Nickel Brook Equilibrium ESB with balance as the primary objective. 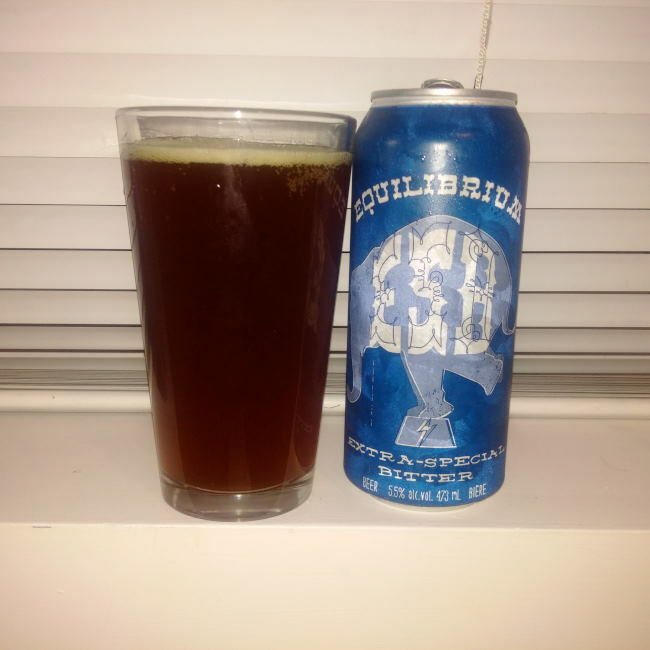 Equilibrium has a great malt character and full body that you expect in an ESB. We balance it with a generous dosage of hops that gives Equilibrium a distinct fruity flavour and appropriate level of bitterness. We advise you to find your Equilibrium today!